With the end of the year comes unpredictable weather conditions. The hurricane remnants bring heavy rains and strong winds that often equal power outages. The early snowstorms make us want to crank up the heat indoors to keep out the colder temperatures. Once in a while we even get those fall summer-like days that are perfect for turning on the old AC. So, it’s good to make sure all of your systems are ready to go when you need them. … and with a tap, you can contact Werley in an emergency. According to Petko, the company installs and services oil systems, heat pumps, air conditioning, geothermal systems, indoor air quality products, gas systems, generators, and water filtration and treatment systems. Werley Heating & Air Conditioning Co. has crews of technicians who are skilled in the latest factory training and NATE certification. “A new furnace, heat pump, or air conditioning system is a major investment that comes every 15 years or so. It is an investment that should be given careful consideration because you have to live with the choice for years to come. We are experts when it comes to evaluating your home comfort system requirements and recommending equipment that not only fits your needs and budget, but will substantially lower your utility costs,” Petko says. Werley Heating & Air Conditioning Co. offers some unique products. There is the saltless water filtration and conditioning system by Krystal Klear Water Systems. For home generators, you can choose from such top brands as Generac and KOHLER. According to Petko, the company will be highlighting their latest products at the Spring Home Show at Stabler. The show is presented by the Lehigh Valley Builders Association. It takes place April 1-3, 2016. Customers can meet the Werley team and learn all about their systems. Werley Heating & Air Conditioning Co. also offers unique utility and manufacturers rebates, service agreements, and extended warranties. “Our customers often tell us how much they appreciate that someone is always on standby 24 hours a day waiting to take their call if service is needed. We dispatch our certified technicians to the location in a timely manner. Our men are neatly uniformed and carry photo ID badges for your peace of mind. And when many other companies are not taking new customers, we always are out there to help,” Petko says. For tech savvy clients, Werley Heating & Air Conditioning Co. has their own app. Available on the App Store and Google Play, the free app has several functions. You can ask questions for expert advice. You can schedule an appointment or consultation, record and send voice messages, and schedule reminders for maintenance. And with a tap, you can contact Werley in an emergency. To save energy, Werley Heating & Air Conditioning Co. offers some helpful tips. Be sure to schedule annual maintenance for your equipment. A seasonal checkup ensures efficiency and extends the life of the system. General cleaning prevents costly repairs and poor indoor air quality. Filters on furnaces and air conditioners should be cleaned or replaced regularly. Take the time to clean radiators, baseboard heaters, and warm air registers. Consider the installation of a programmable thermostat to save money when you do not require a constant temperature. Prep your home to withstand the elements, including insulation in the attic and crawl spaces and sealant around doors, windows, and air ducts. Be sure to take AC units out of windows before winter. Keep in mind that you can use ceiling fans, draperies, and window screens to adjust the temperature in a room. Select products that are energy efficient when you purchase new cooling and heating equipment. For a furnace, you want to look for a high Annual Fuel Utilization Efficiency (AFUE) rating. The minimum is 78 percent, but you can find models that go above 90 percent. With an air conditioner, look for a high Seasonal Energy Efficiency Ratio (SEER). The minimum is 13, but there are ACs that exceed 14.5. 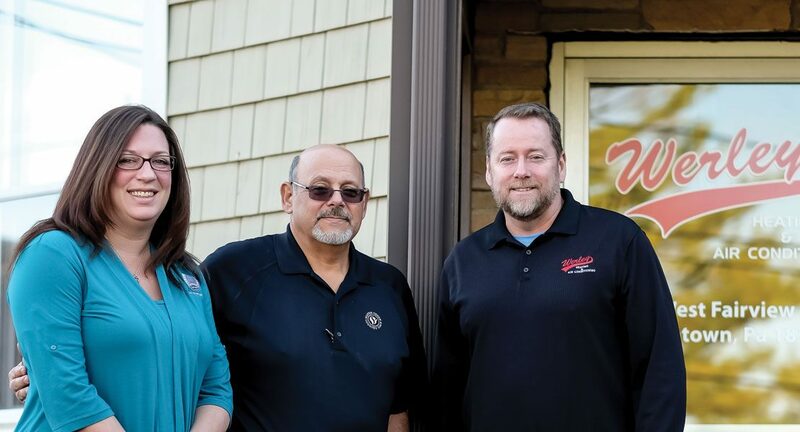 “We strive to become the preferred supplier of air conditioning heating and maintenance in the Lehigh Valley by providing an exceptional level of both quality and service and by placing the needs of our customers before our own. We believe that the most important thing is servicing our customers and everything else comes as a result,” Petko says. To schedule an appointment with Werley Heating & Air Conditioning Co., call 610.821.8414. You can visit them online on Facebook or their website, callwerley.com.